Bathrooms can be one of the most dangerous areas of the house. Those with limited mobility are more likely to encounter accidents in this room than any other room in the house. Falling inside the bathroom can lead to serious injuries such as sprains, fractures, or even head trauma. 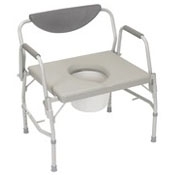 Bariatric Bathroom products are specifically designed for bath and safety needs of users over 400 Lbs. NewLeaf Home Medical has you covered when it comes to increasing the safety of your bathroom or dealing with bathroom-related accidents. 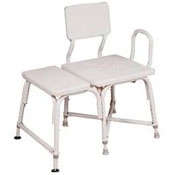 Customers can choose from our selection of Bariatric Bathroom and Safety products including Bariatric Shower/Bath Chairs, Bariatric Commodes and Bariatric Toilet Frames.